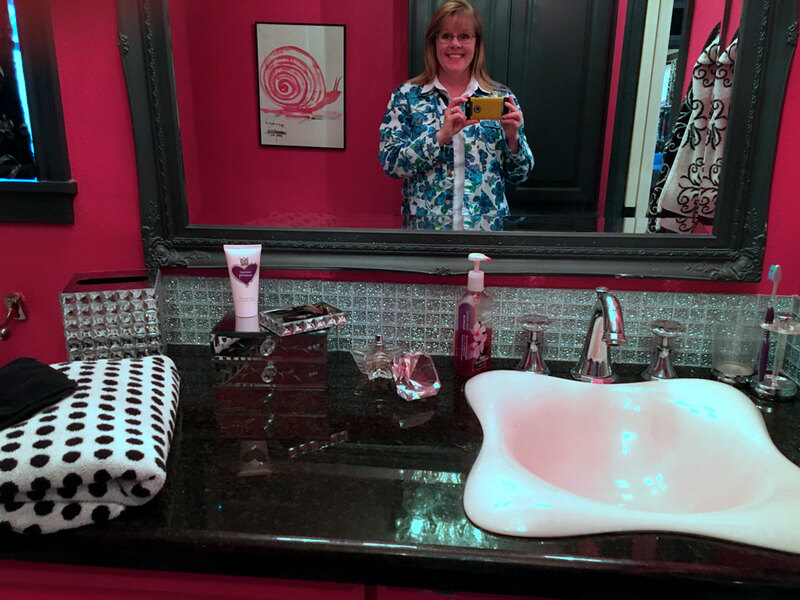 I was absolutely thrilled with the positive responses to my January Round Up post where I shared some of the comments on my blog posts along with my replies. Sian said...I really enjoyed reading this post. And thank you for answering my question :) I hope you keep up this kind of a round up: it's been very interesting to have you take us back and revisit some of your stories from the month. Jane said...what a lovely post, I do enjoy reading your blog. Sandra said...All your posts are enjoyable but this one just had the edge ... I loved it. Cheri said...The round-up is great. 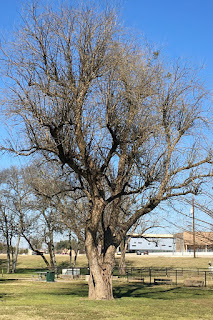 Rinda said...What a great post, and Susanne said...I love this kind of post because it highlights the back and forth of commenting on blogs. 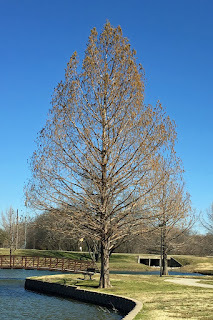 So, I'm excited to continue with a round-up of comments and replies from my February blog posts. Susanne also asked...And what is the next book in the SS book club, I missed out in January and hadn't seen the Feb. book yet? 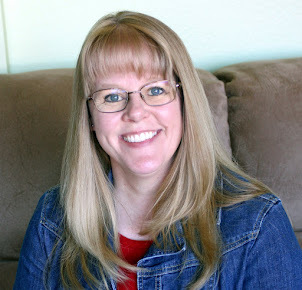 This was an easy question to answer because Jennifer Wilson actually posted the first six month's books on the Simple Scrapper Book Club page. 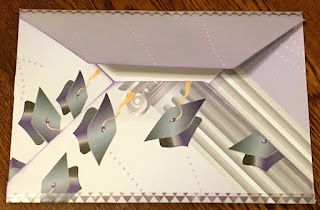 I did not participate in the February discussion as we were out with friends that evening, however I'm almost done with the book (Better Than Before) and will be sharing my thoughts an upcoming post. 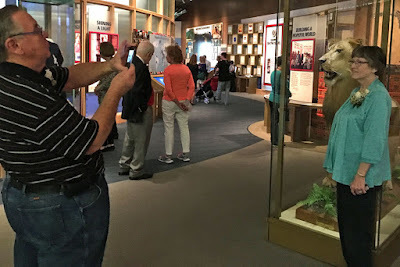 When I said Hello to February and mentioned that I had not accomplished my "adventure" goal of spending a day at our local science museum, Ellyn said...great month! we stole your January adventure and EXPLORED the Perot Museum with Leigh Anne yesterday! lots of fun. So glad I could provide the INSPIRATION for their outing! I shared my healthy living progress/successes for January, and Juliann said...Well done! I like that quote about striving for progress not perfection. That quote was one provided by Cathy Zielske in the FIT 2016 workshop. I really like that she's providing these motivational quotes throughout the year! 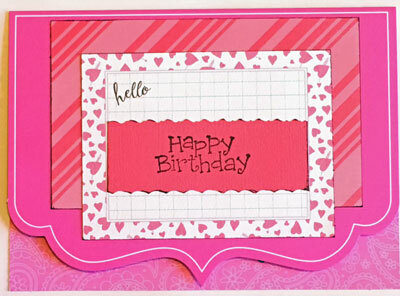 Cheri said...I'm so glad you joined too! I am happy to have company on this crazy journey this year. I get really jealous when I see people for whom the weight just seems to be melting off as I am struggling for each and every pound, but I'm committed this year. I've been fighting that internal voice that keeps telling me to throw in the towel - eat the cookies and bread - stop trying so hard. I think maybe it is finally starting to get the hint! Alison said...Well done Melissa.....I started well but my trip put me off again...am trying to get back on track now. I was thrilled with my January progress, but (as you'll see in an upcoming post) my February did not result in the weight melting off as easily. After sharing my book review of The Shipping News by Annie Proulx, I learned something new when Jane said...I've not read the book but have seen the film as someone recommended it to me. I can't say I enjoyed it much but I do find the book is always better. And Karen said...Our book group read The Shipping News years ago, and if I remember correctly, we, too, gave it mixed reviews. It wasn't any easy read, but the writing was remarkable, and we were glad we had read it. I only vaguely remember seeing the movie. I had no idea there was a film based on the book. 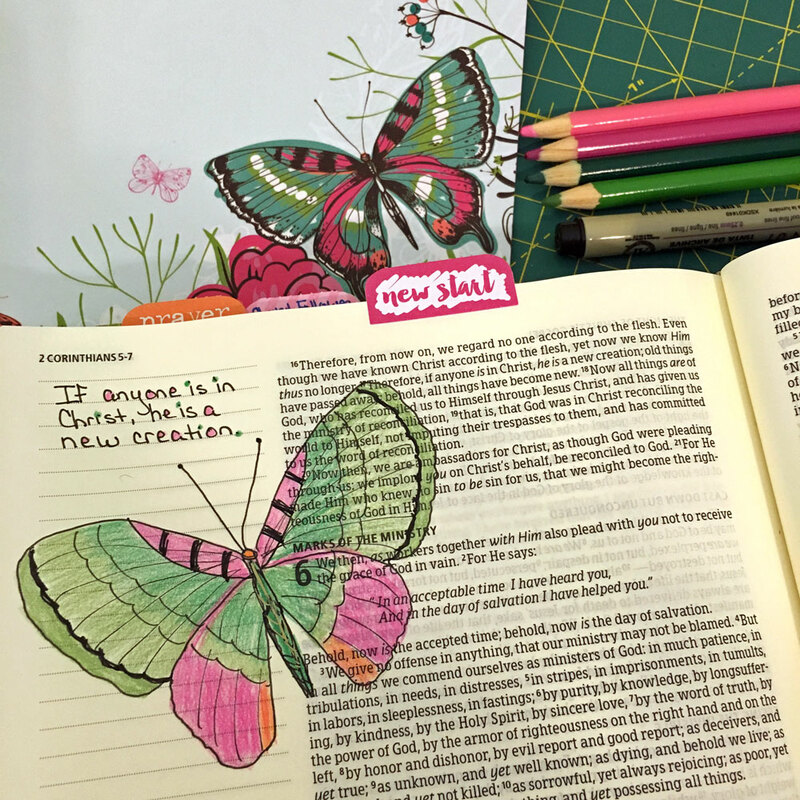 As I share my Bible Journaling pages, I often get comments like this one on my Sunday Musings - Obedience post. Barbara said...I love your artwork. I think it's a wonderful way to combine your spirituality with your art. Unfortunately for me, I cannot draw a single thing! 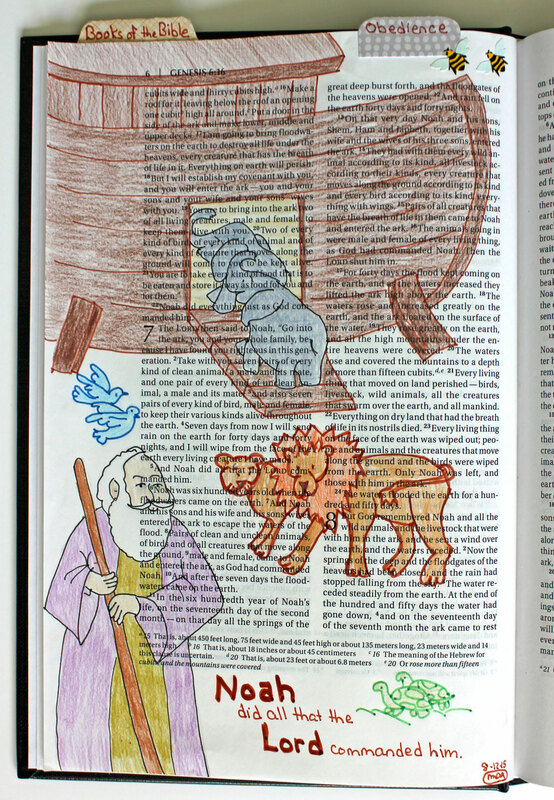 Still, it would be fun to stumble upon a bible illustrated like yours. I must admit that most of my art (like the first example in that post) is traced, often from coloring pages! 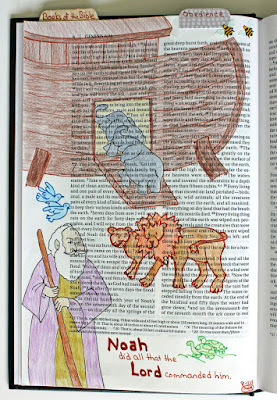 I place the coloring page under my Bible page, trace with pencil, then go back over that with a pen before coloring. Here's an example where I traced the image from a piece of patterned paper. Juliann said...Thank you for sharing this. I have been thinking a lot about God's call in my life through creation. I also want to start journaling in my Bible but every time I pick up my pens I freeze. I know I just need to start. For those of you in this situation, I wrote a post last fall about overcoming obstacles to getting started with illustrated Bible journaling. 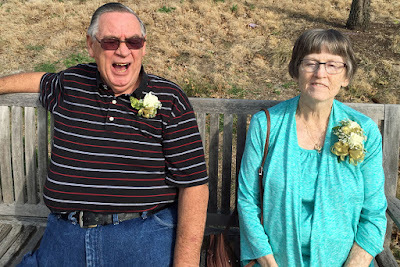 Thanks to each of you who commented with congratulation on my parents 50th anniversary - they enjoyed reading through those comments! Helena got me wondering, too, with her comment about the Gifts to the American People...a fascinating display - made me wonder who has the job of choosing such gifts in some of these countries - I think it would be a fun task. And Mary-Lou said...A very interesting Snap collection. 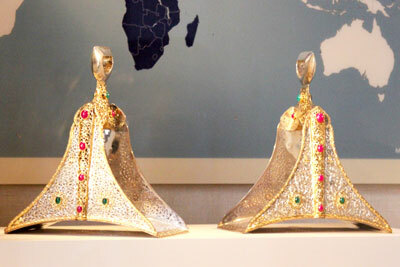 Some truly unique & beautiful gifts. 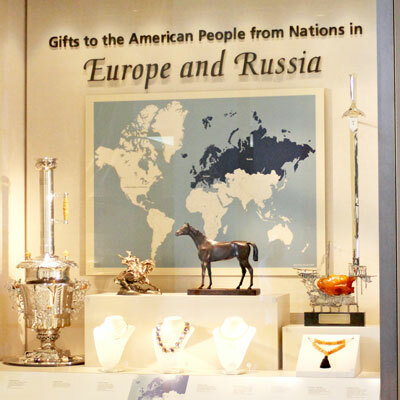 I would be curious about the tale with each item of why it was chosen to represent the country giving the gift. 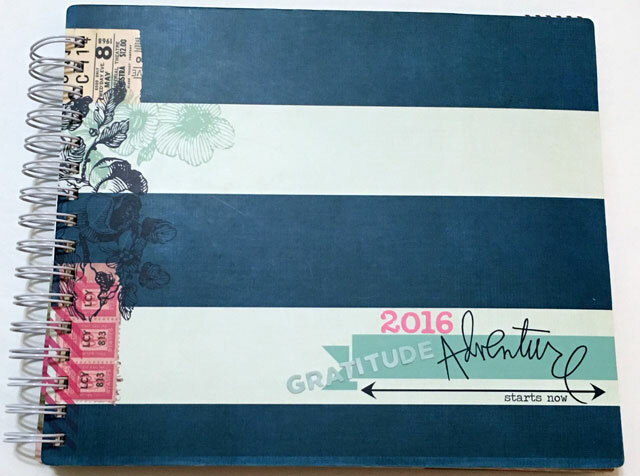 I am enjoying my Gratitude Journal this year and found that many of you also track the things you're grateful for on a regular basis. Karen said... I am keeping a gratitude journal this year, but it's not anywhere near as elaborate as yours. Mary-Lou said...I have kept one for years & I would recommend to everyone. Cheri said...Right now I'm keeping a "Five-Minute Journal" that I write in each morning what I'm grateful for. Writing my gratitude in the morning rather than in the evening is a very different perspective. Ann said...I don't keep a journal but do write everyday in my planner the happenings of the day. I like to reflect back on what happened and note anything noteworthy. 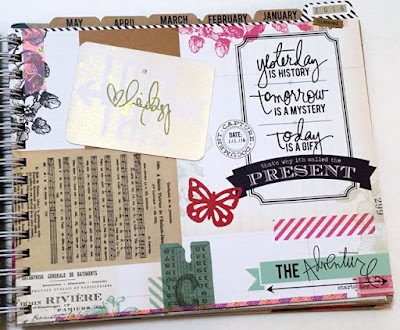 Rinda said... Last November, I kept a daily gratitude log. Sandra said...I love this, really do. I don't keep a separate gratitude journal but i write down each day 3 things I'm grateful for in my bullet journal. However I did capture a few shots of the great accommodations. 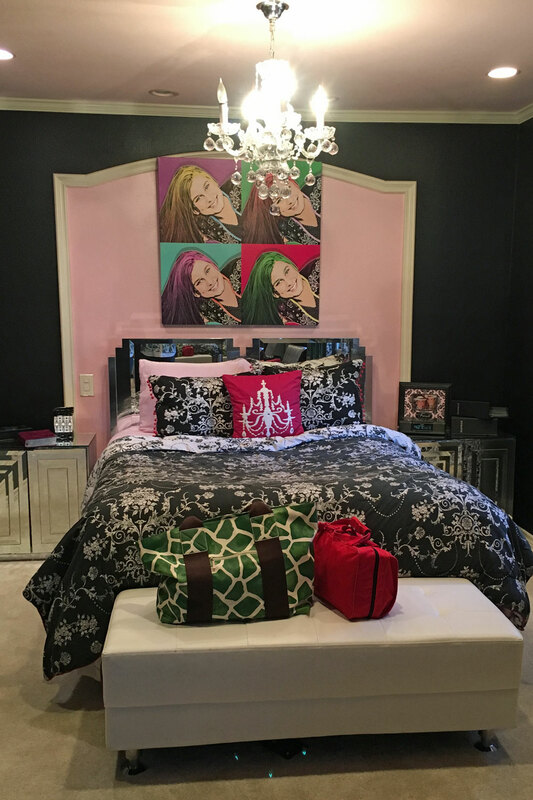 My host's daughter is away at college, so I got to enjoy the Princess Suite during my stay! Item #33 on my my 50 Things To Do Before I'm 50 list is fast for 3 days again. This is one of those goals that I included specifically to help me in my spiritual growth and my daily walk with the Lord. I believe that fasting is very personal and am sharing my thoughts and process for this fast as a way to document it as a completion for my list of 50 Things To Do Before I'm 50 and for those who may be interested in learning more. I believe that fasting (willing abstinence or reduction of food and drink) can be used as a way to draw closer to the Lord. I have to admit that I have not participated in a lot of fasts and am not an expert on the nuances of fasting, although over the years, I've seen and heard about numerous ways and things to fast. One popular trend in our world of technology is to fast from social media. I don't think there's a right or wrong way, just different ways. I believe it's the intent and purpose of the fast that is most important. I chose a partial fast by cutting out most foods. For the 3 days, I had primarily liquids, with the addition of a few crackers during the day and soup (noodle or egg drop) for supper. I spent most of my time at home, although I did get out one morning for a round of errands. I did 30 minute sessions of light exercise the first two days but skipped it on the third day. 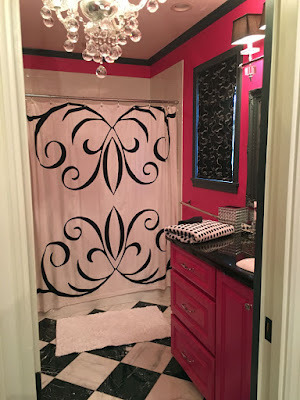 Other than cooking, I did my normal daily and weekly chores around the house. I did not share that I was fasting with anyone other than Robbie. 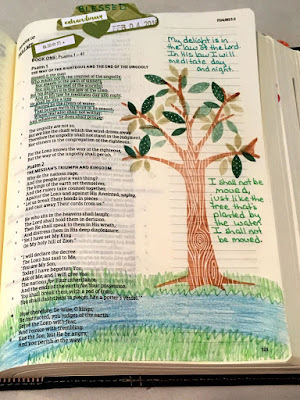 The purpose of my fast at this time was to focus and meditate on what the Lord is calling me to do, to spend time in the Word and in prayer, and to prepare devotionals for upcoming illustrated Bible journaling workshops. It was a refreshing and productive three days. There are a couple of personal issues that I have been praying about for some time, and, while those prayers have not yet been answered, several things happened on the third day (an email, a couple of phone calls) that assured me that God hears my prayers and will answer in His timing. 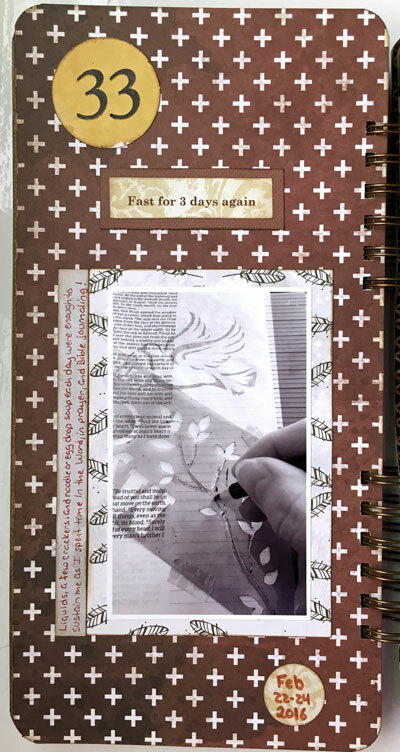 I used a photo of me working on an illustrated Bible journaling page for the page in my 50 Things To Do Before I'm 50 mini-album. Before my fast, I read 40 Days of Decrease by Alicia Britt Chole. I had not actually planned my fast when I requested the book (which I received free from Booklook Bloggers in exchange for an honest review), but I'm sharing the review here as it is about fasting. The concept of the book is to fast something different each day for a 40 day period. It calls for fasts of things like apathy, injustice, hypocrisy, addiction, and criticism. I like the concept set forth, however I did not like the format of the book and found it difficult to get through. The book is designed so that one chapter is to be read and used each day. The chapters begin with a discussion of Jesus during the final week before His crucifixion, following along with the story in the gospels so that it progresses throughout that week a little in each day's reading. There's typically a quote included in this section, boxed off and somewhat relating to the topic. Next there's a short section titled Reflection, followed by the Today's Fast section and a brief description. Often I found it difficult to envision a way to fast a particular attribute. The next section is titled On Lent, which discusses the history of fasting during the Lenten season throughout the centuries. I found these sections of history rather difficult to follow as it was broken up into the 40 days. 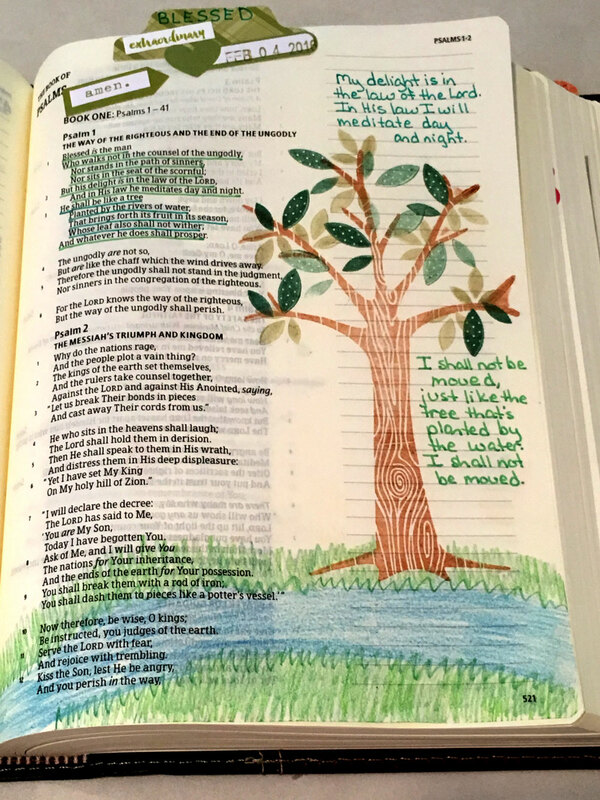 The final page of each chapter contains a suggested reading from the book of John along with blank lines for note-taking. Honestly, I think the first sections of each chapter put together would make a nice book about the final week of Jesus' life. And the sections on Lenten fasting would probably make a very nice research paper. However, (to me) having so many short sections for each chapter made the book seem very disjointed. I have to note that I was reading the book through rather than simply reading one chapter a day. Please share your thoughts on fasting in the comments. I've thought about keeping a gratitude journal off and on over the years. Actually I kept a journal for a short while many years ago, and I've often recorded things I'm thankful for in my journaling. 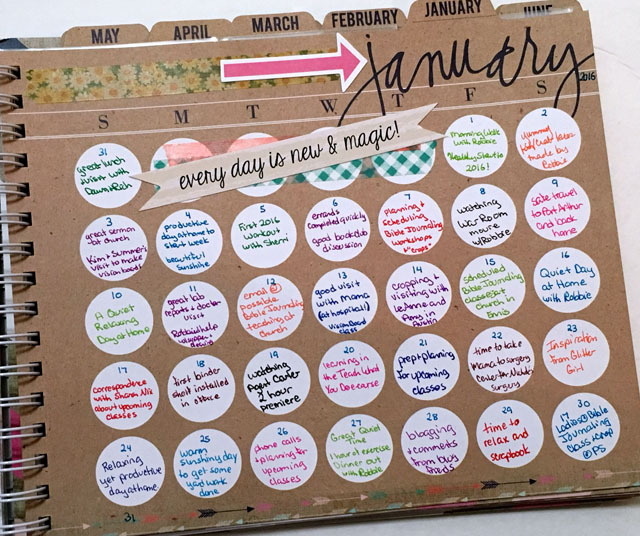 When I added keep a daily/gratitude journal for one year to my 50 Things To Do Before I'm 50 list, I knew it would be the perfect incentive for me to actually do it! At the Play in Anaheim! 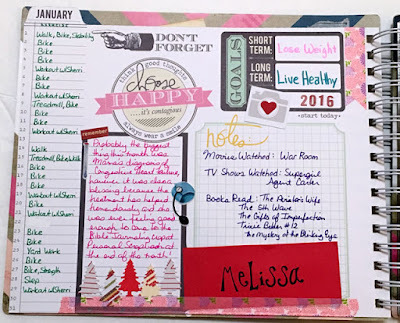 event in January of 2014, Heidi Swapp gave me (and all the other participants) a beautifully wrapped Memory Planner album. Heidi shared how a few years earlier she had recorded one small detail of each day on a calendar and how grateful she was to have those memories preserved. She designed this book based on that experience. I thought at the time about using it for a gratitude journal, but since January was halfway over, I decided to wait and try it in 2015. However, I did not get to that project last year . . . but Cheri did, and I enjoyed seeing her pages each month and vowed I would use my album similarly this year. 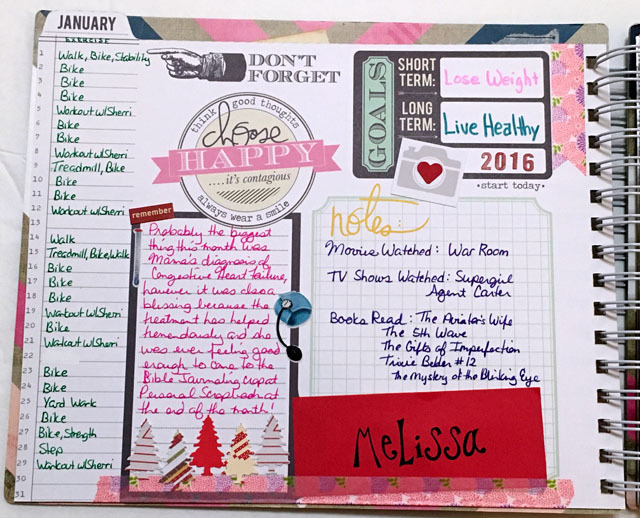 So, on January 1, I opened my planner to the calendar page and began to record what I was grateful for each day. I was thrilled at the end of the month to have taken time to record something every day, but it was a couple of weeks into February before I actually added some crafty bits and finished up the journaling and pocket pages for January. I started by adding the word "Gratitude" and the year to the title block on the front of the album. 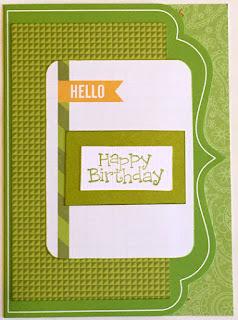 This album is already printed with lots of pretty bits & pieces, but I still added in my own little bits. 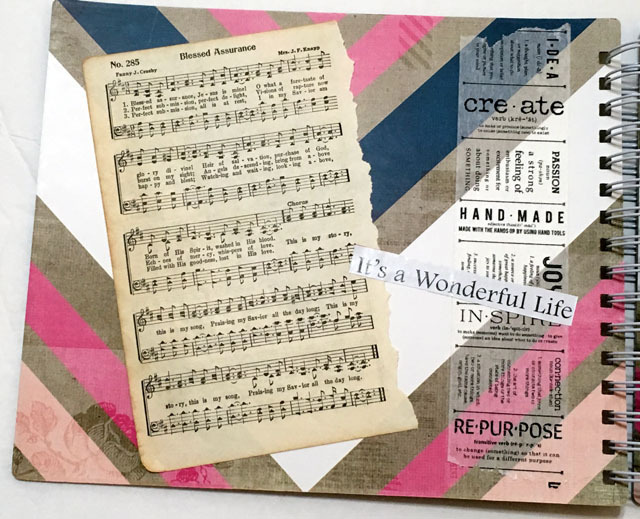 On the inside front cover, I added a page from an old hymnal (that I'm using for demonstration in my Bible journaling workshops), a strip of wide washi tape, and title I had in my Word Jar. 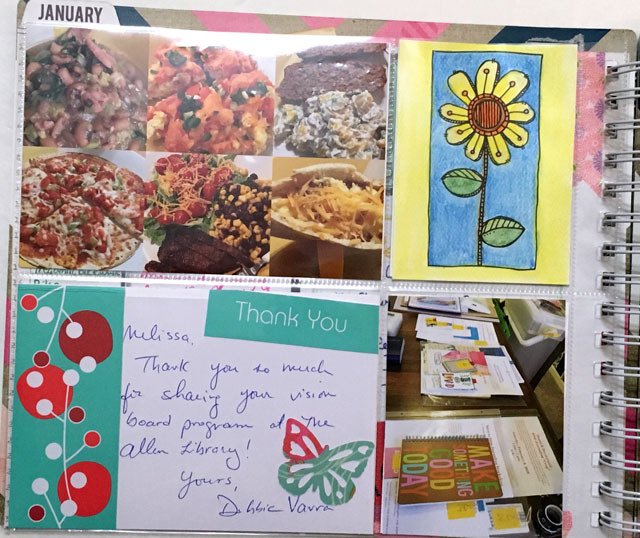 The first page already had a collage background, so I only added a few pieces: the signed card from Heidi that served as the gift tag, a butterfly, the small blessed word sticker, and 2016 number stickers on the tab. There are four pages for each month in this planner: a journaling page, the front and back of a pocket page protector, and the calendar. I decided to use the notes page to document my daily exercise, lists of the movies and TV shows we watched, and books I read. 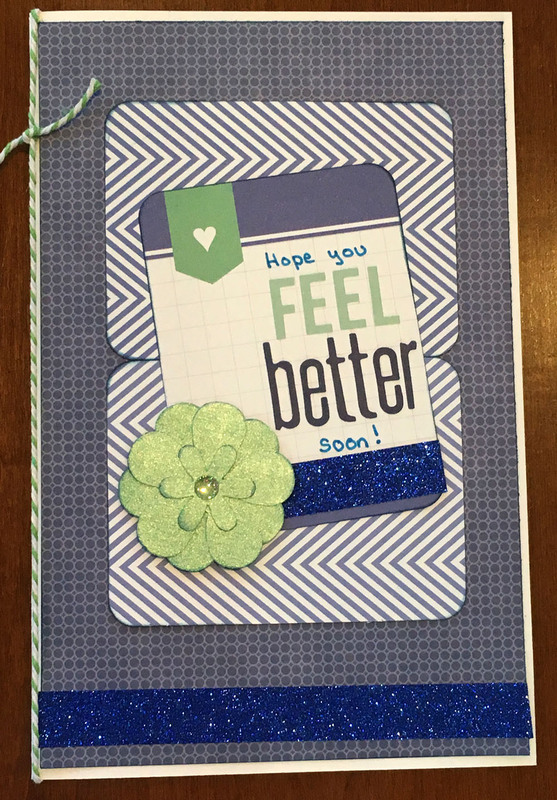 I also included a paragraph of journaling, a few extra embellishments, and the name tag from the crop I attended at my friend Amy's home. The pocket page holds photos and memorabilia. The photo of me and Robbie on New Year's day and me and Mama coloring at the hospital are two of my favorite photos from January. 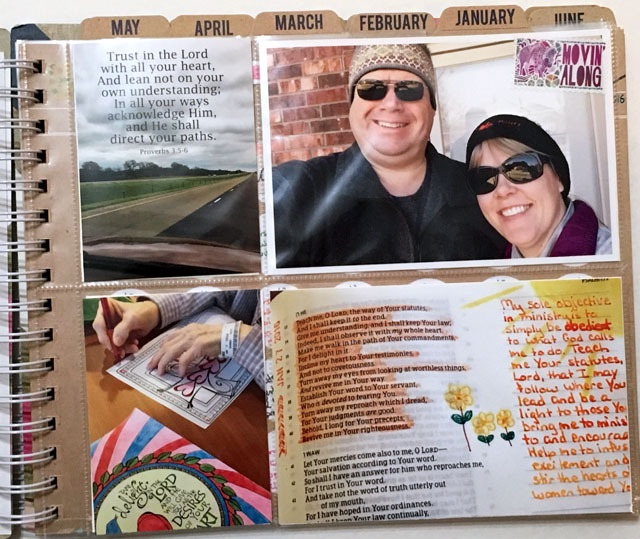 The top left pocket holds one of my Scripture & Snapshot photos, while the bottom right showcases one of my Bible journaling pages. I included a collage of the new recipes we tried to represent our healthy eating choices and the photo of piles of notes and supplies spread out on my table to represent all the preparation I'm doing for upcoming classes. The flower card is from one of the Art Play Paintable sheets; I watercolored it (using water color pencils and a water brush) since I've been using a variety of those 3x4 and 2x6 pieces in my workshops. I also included the thank you card I received after teaching the Vision Board Class at our local library. The final page is the calendar with my daily gratitude entries. I'm thrilled with the way these pages turned out and am looking forward to working on this album each month this year! Do you keep a gratitude journal? What format do you use? 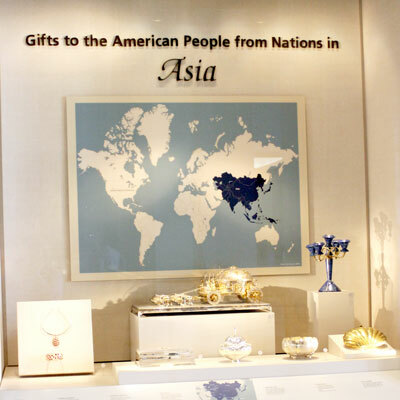 The display cases in the lobby of the George W. Bush Presidential Library house gifts that the president and first lady received from around the world during their years in the White House. 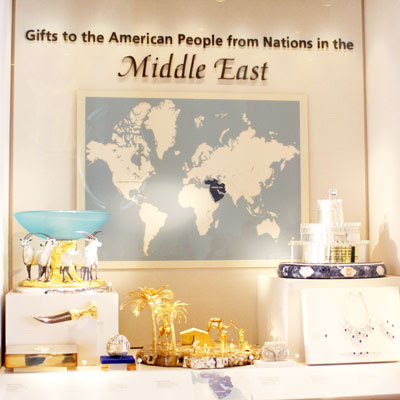 Each display area showcases gifts from a particular region. Here's a closer look. 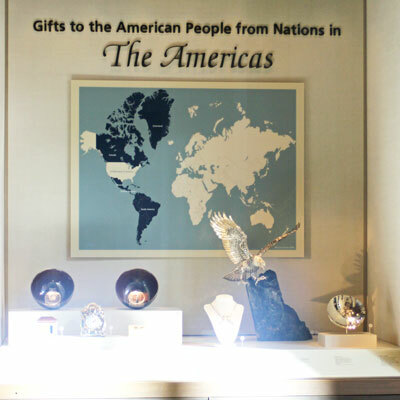 With the sunshine in the lobby area, other visitors milling around, and the glass fronts on the displays, it was difficult to get snaps that show the beauty and uniqueness of these gifts. 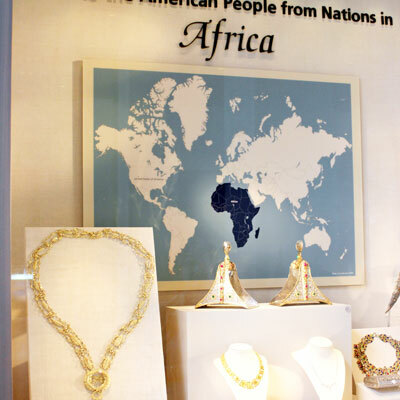 Here's a zoom in on the Africa display. 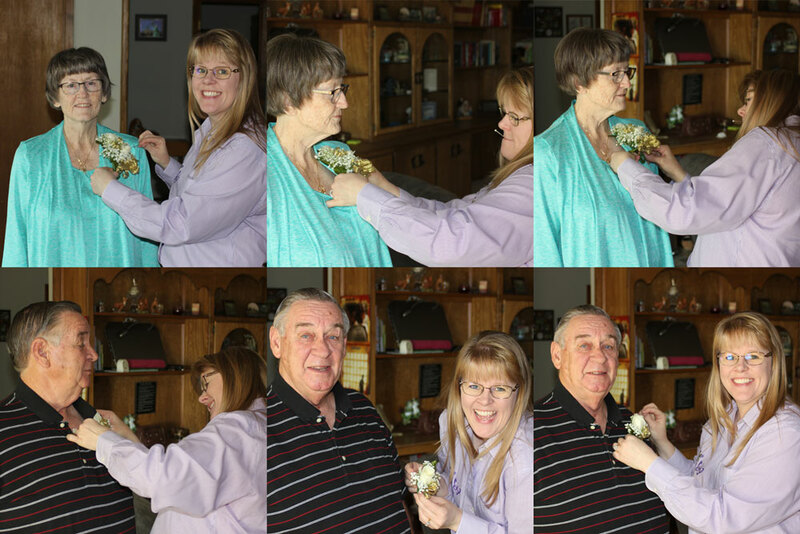 We picked up a corsage and boutonniere for them to wear during the day, and I had quite a time trying to get them pinned on! Of course, a photo shoot was in order to commemorate the day, which was absolutely beautiful with sunshine and temperatures in the 70s. Our first stop was Rafain Brazilian Steakhouse. 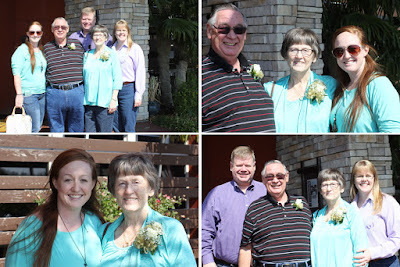 I was thrilled that my niece Nichole was able to take a long lunch hour and join us. 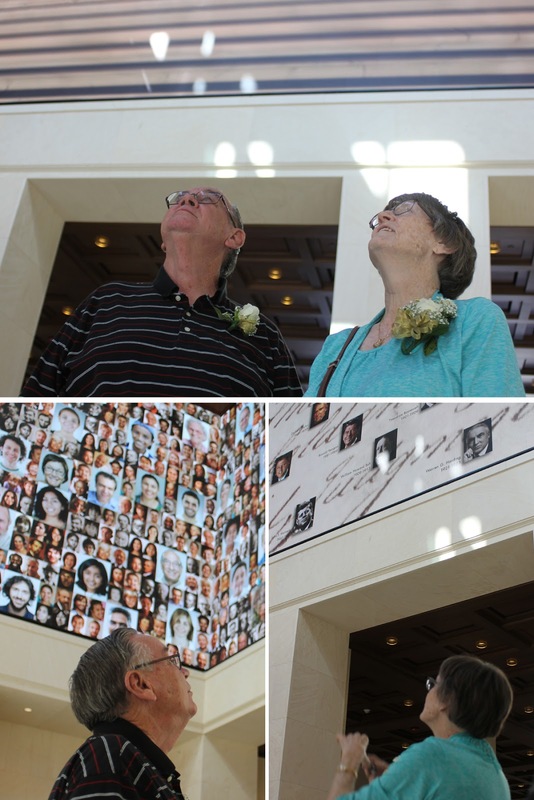 Mama & Daddy shared memories of their wedding day and the places they lived as a young married couple while we ate. 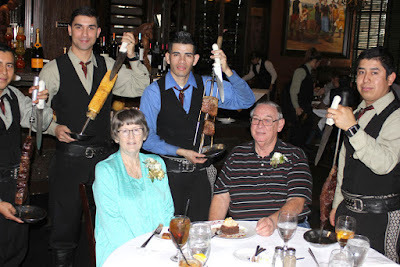 Robbie and I had been to the steakhouse a few times before, but this was the first time Mama & Daddy got to enjoy the three-course meal and experience all-you-can-eat churrasco (meat cooked over an open fire) served table-side. Of course, we took a few more photos after the meal! 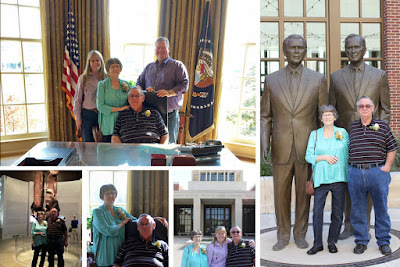 Next we headed to the George W. Bush Presidential Library where Mama & Daddy enjoyed seeing highlights and memorabilia from former President George W. and Mrs. Laura Bush's life and presidential years for the first time. There's a wonderful display in the entry hall that features 20-foot-tall, 360-degree, high definition video, and I love these photos that I captured of Mama & Daddy enjoying the show. Mama takes photos occasionally with her phone, however it's very rare that Daddy does. I believe the only one he took all day was one of Mama standing by the stuffed lion! We all had a great time at the museum, but I think Mama & Daddy were getting a little tired, judging from this photo of them waiting for Robbie to bring the car around. We all enjoyed a snack and soft drink on the drive back to their house, then had a little time to just rest and visit. Then Robbie drove Daddy to the car repair shop to pick up Mama's car. 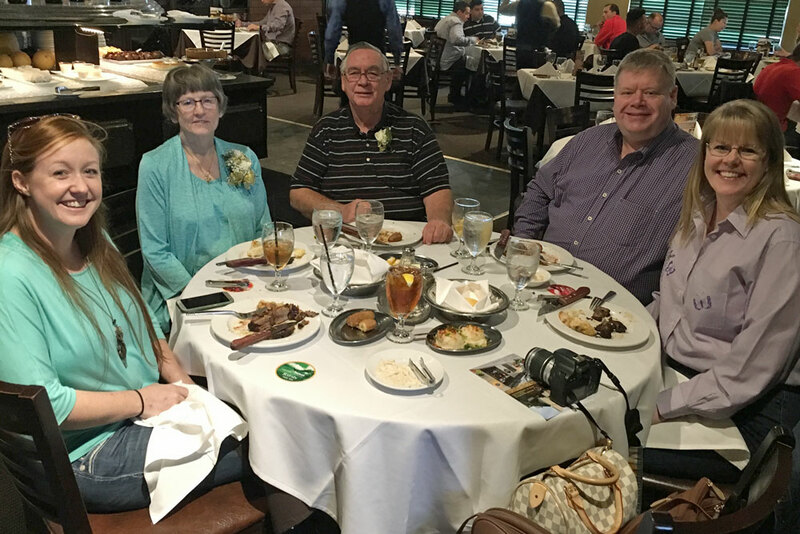 I had arranged with my niece that she and her hubby would bring a light dinner by and join us for the evening. It was so much FUN playing Phase 10, laughing, and telling stories (like my teenage driving stories that no one ever seems to forget!). 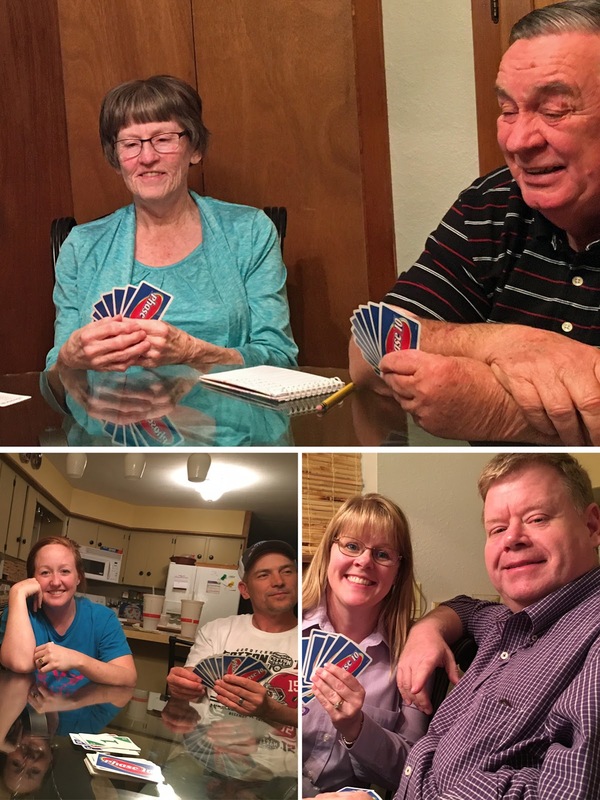 Who knew it could take three hours to complete a game of Phase 10! 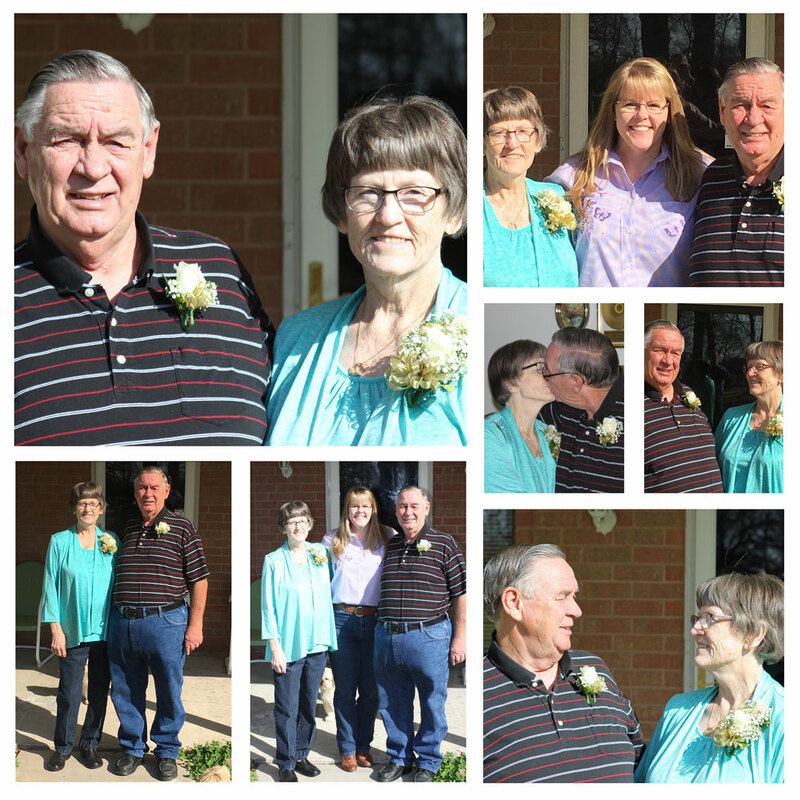 It was a great day all around! As I've been rereading the book of Genesis this year, I've been struck once again by the examples of obedience (and disobedience!) that fill this first book of the Bible. Biblical obedience simply means hearing God's Word and acting accordingly. Such a simple definition for something that is often difficult in a world that shouts for us to find our own way and to do certain things (or not do certain things) so that we'll fit in and be accepted. However, the Biblical examples clearly demonstrate that obedience to God leads to blessings, while disobedience leads to undesirable consequences. 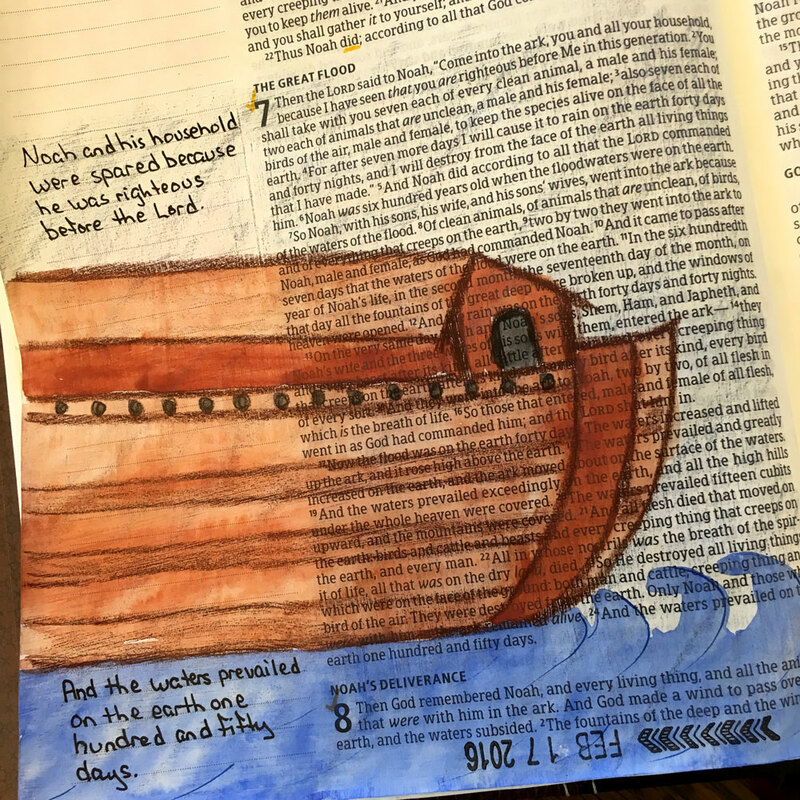 The story of Noah and the flood is familiar to many and provides a wonderful example of obedience. 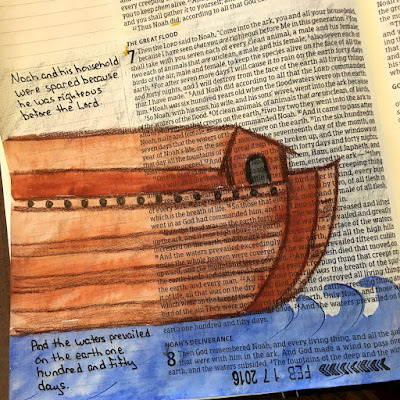 Noah built an ark based on God's directions. Genesis 6:22 tells us that Noah did all that God commanded him. 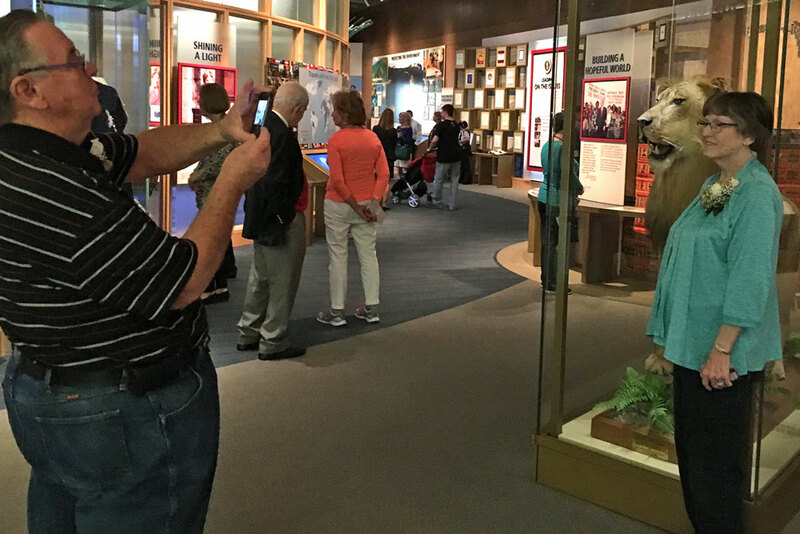 Noah was a righteous man who walked with God, yet it must have been difficult to stand strong through the ridicule and questions that surely came his way as he spent years building the ark. Yet, he and his family were saved because of his obedience. I have to admit that I'm glad God hasn't called me to build a boat in my front yard. (In fact, I'm pretty sure it's against our homeowner's association's regulations!) 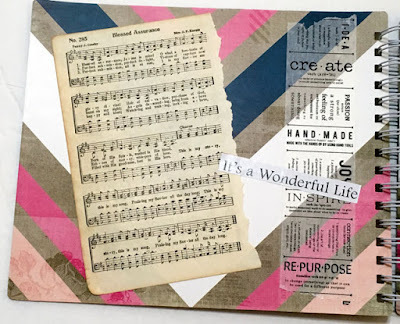 However, as God is calling me to share more and more about Him through illustrated Bible journaling classes and opportunities to teach, I want to follow the examples He's given us in His Word and do "all that He commands." 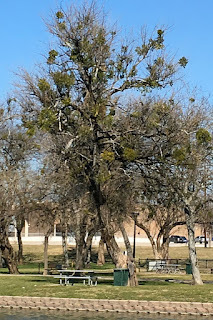 I've been thinking about trees a good bit lately, so when Robbie and I took a walk at a local park on Monday I snapped these photos. 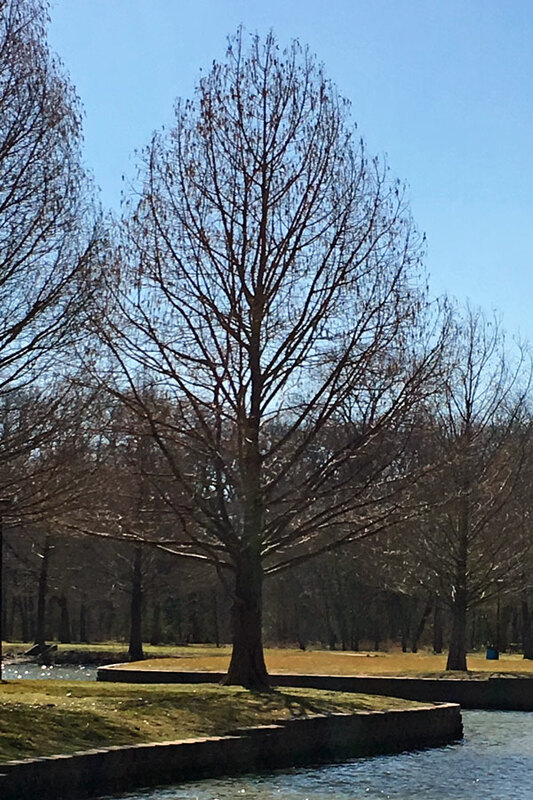 The trees are still pretty bare here, but the warm sunshiny days are teasing that spring is just around the corner. 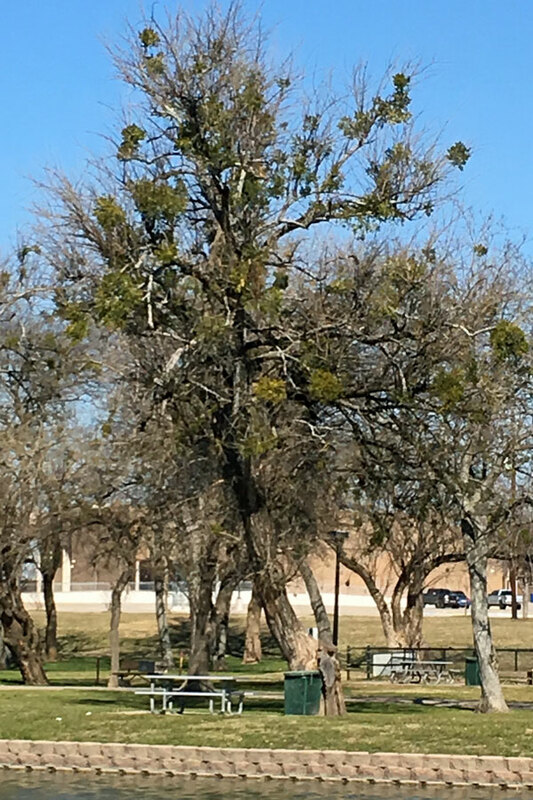 Some of the trees are beginning to bud, while others are still completely bare. The grass is already starting to green up, so it won't be long before it'll be hard to recall all this bareness. 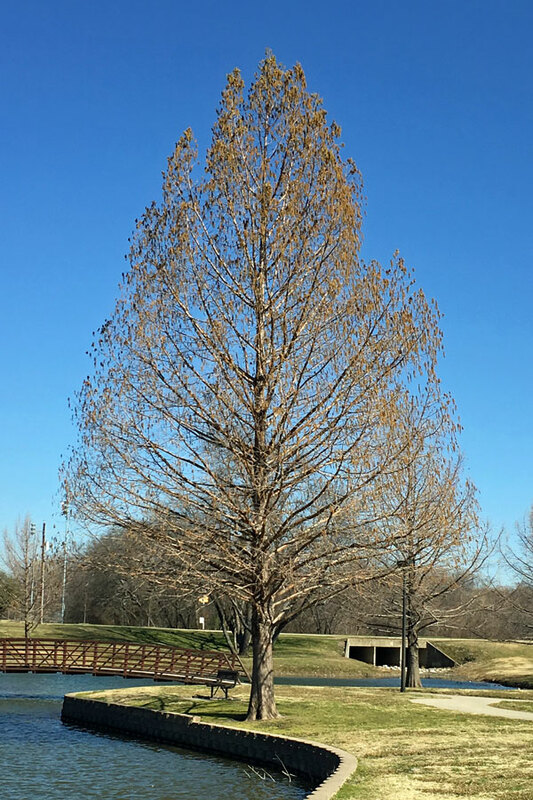 And these trees planted so near the water will definitely be covered with leaves and provide wonderful shade. 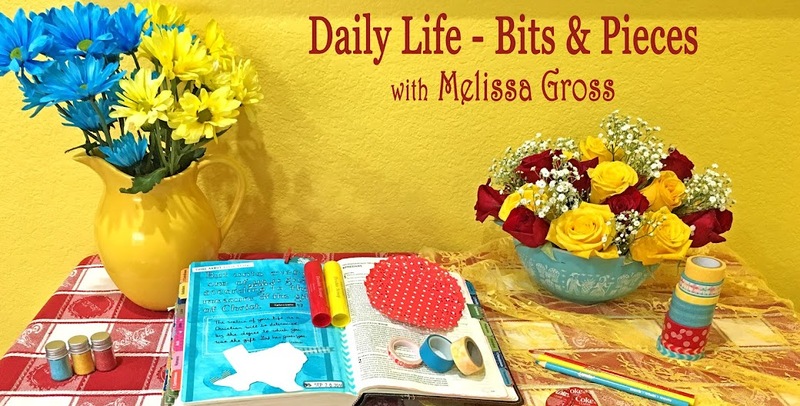 This past weekend I shared a devotional in the illustrated Bible journaling classes I taught. The message was that we need to be rooted in the Word in order to be growing and fruitful in our walk with the Lord, thus my lingering thoughts about trees. As part of my goal to read all the Pulitzer Prize winners in fiction, I recently completed the 1994 winner, The Shipping News by Annie Proulx. So far, the Fiction Pulitzer Prize winners I've read have been ones that I either really like or really don't like. However, this book falls in the middle as there were things I liked (the innocence of Quoyle, the main character, and his love and care for his daughters) and those that I didn't (the writing style, the numerous illusions to sexual assault). The story is set in Newfoundland, a large Canadian island that I honestly do not know much about. The book portrays the island as a rather inhospitable place inhabited by an eclectic cast of characters who endure the stormy and unpredictable weather along with unusually high incidents of sexual abuse and car accidents. The setting is a dreary backdrop for the story and the writing style, while poetic in a sense, made for slow reading. 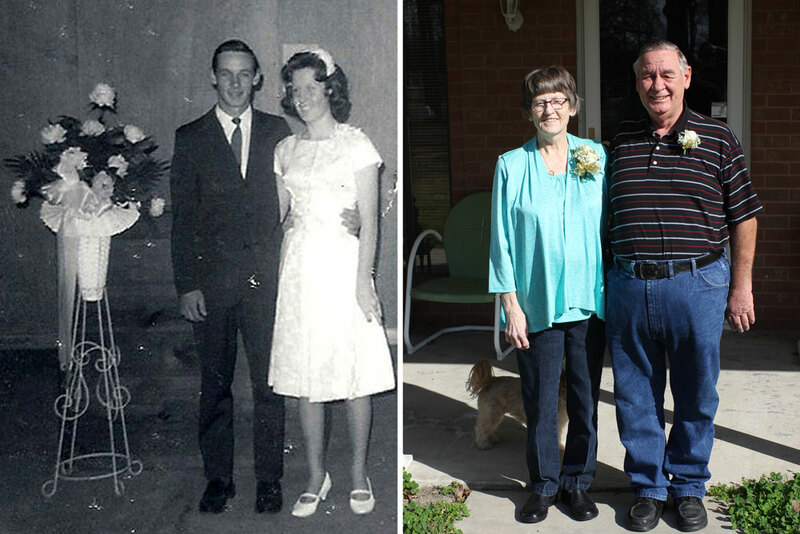 I did enjoy the story of Quoyle and how he came to Newfoundland and made a life for himself and his daughters after his philandering wife was killed in an accident, and I was glad that he found love in the end. Here's a great quote when he first began to consider the possibility of finding love, or at least comfort, with someone new. On the stairs an image came to him. Was love then like a bag of assorted sweets passed around from which one might choose more than once? Some might sting the tongue, some invoke night perfume. Some had centers as bitter as gall, some blended honey and poison, some were quickly swallowed. And among the common bull's-eyes and peppermints a few rare ones; one or two with deadly needles at the heart, another that brought calm and gentle pleasure. Were his fingers closing on that one? Once again this year I am striving to create and send handmade cards each month. In January, I completed four cards. 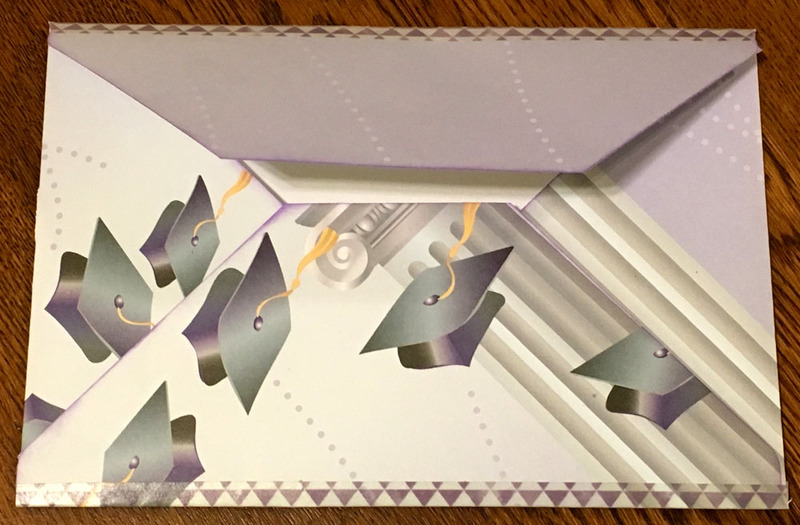 This graduation card was created for my niece Natashia's high school graduation. We traveled down to southeast Texas for her graduation party in early January, although it was bittersweet as there are many broken relationships within my family. 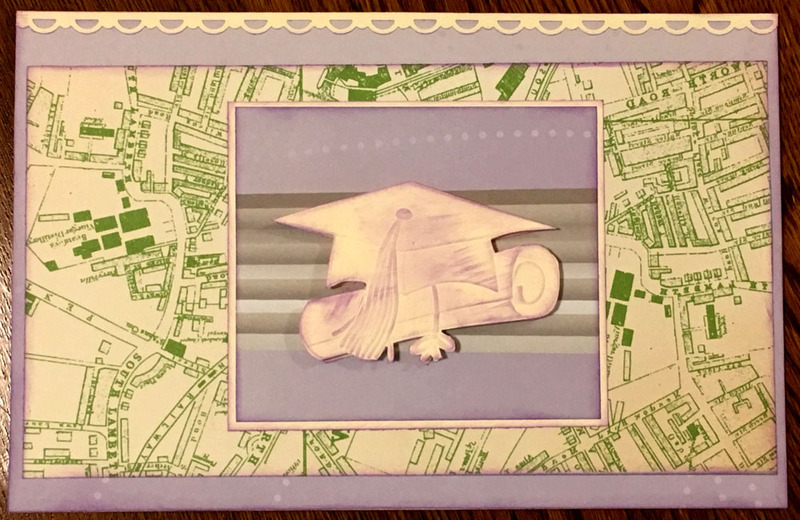 I created an envelope to go along with the card and included a cash gift after Natashia turned down the offer/gift of a trip to New York. 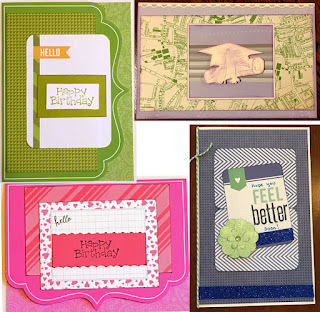 When I was visiting with Mama in the hospital the day before I headed out of town to scrap at my friend Amy's, I joked that I was just going to create some cards with my scraps because I had not had time to pull together any page kits for scrapbook layouts. 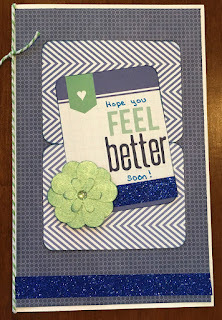 Mama laughed and said I could create her a get well card . . . so I did. I sent this to her before I headed back home. 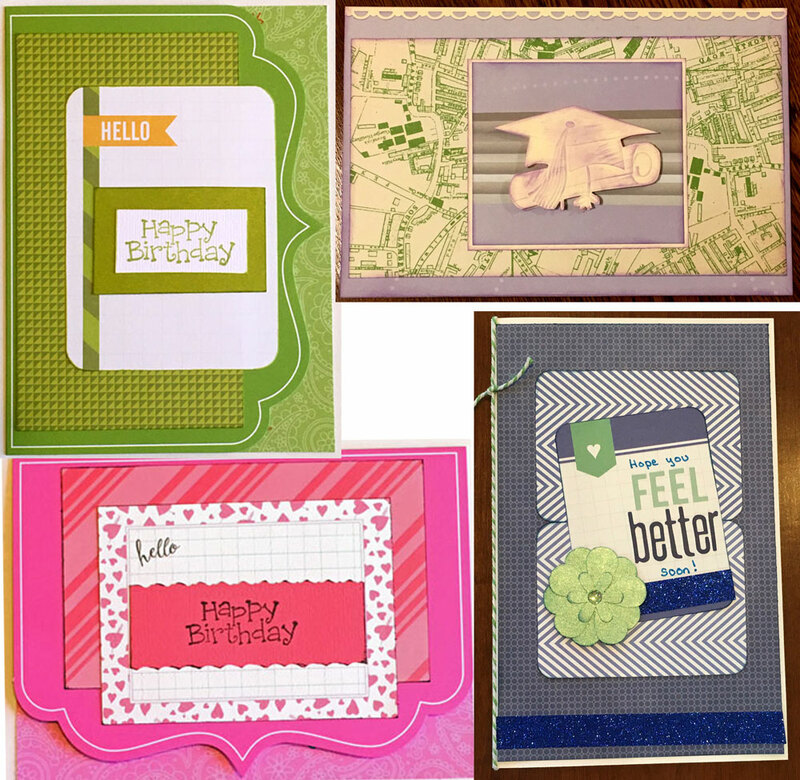 These two similar birthday cards were for my twin nieces as they celebrated their 11th birthday earlier this month.